Welcome to the C.C. Designs February 2018 release! I have to say, I am so excited with what Christine has been coming out with lately. I’ve always been a huge fan of her stamps but lately her coming out with coordinating dies and also stand alone die sets makes it so much more fun!!!! I’m sharing a card today for the release and I also have a release video going over everything in the February Release! You can view the video down below or on my youtube channel HERE. 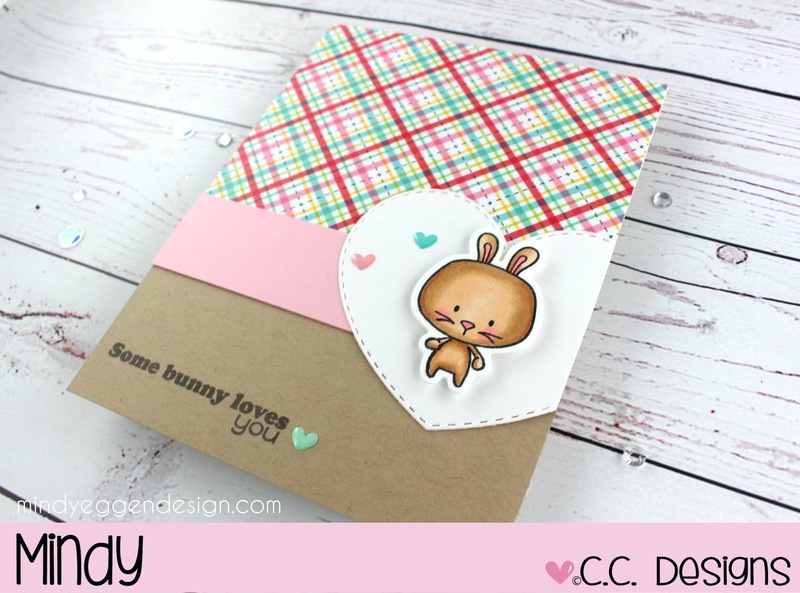 My card today is featuring this adorable bunny from the Easter Cuties set!! I stamped it onto Neenah White cardstock and colored with copic markers. Then cut out with the coordinating die set. These are so handy to have! I used a piece of Kraft cardstock for my base and added a piece of patterned paper from the So Punny Doodblebug paper pack. Then just added a small strip of pink cardstock. I die cut a stitched heart shape and added that to one of my side, cutting off the slight overhang on the edge. I added my bunny with some foam squares and stamped the sentiment from the Easter Cuties stamp set using Chocolate Ink. My finishing touch is adding those cute little enamel hearts also from the So Punny collection. Supplies are listed below.